Creamy Bacon Carbonara with parmesan cheese, bacon lardons and eggs. If you like pasta, you will love this 20-minute Italian dish. No cream, no complicated sauces, just the real deal. The creamy carbonara sauce can’t be any simpler. 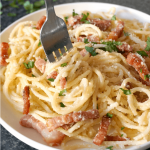 This spaghetti carbonara, although so easy, is posh enough to serve your finest guests with. And it’s so flavourful, it tastes even better than at any fancy restaurant where a decent portion would cost you well over £10. And dinner’s ready in under 20 minutes. Who can blame the Italians for being pasta fanatics? If you can get big flavours from simple ingredients and there no need to slave away for hours in the kitchen, l’m in. Although l probably wouldn’t eat pasta every day, no matter how much l love it. I only visited Italy once, when l went to Venice and Milano. Needless to say that l fell in love with Venice straight away, it must be the most beautiful city in the world. I was really excited about trying the authentic Italian food, and was not disappointed at all. I can’t quite remember all the dishes l had, but one thing stuck to my mind, that even the priciest bottles of olive oil or parmesan cheese from the poshest shops in the UK don’t taste anywhere near the way they taste in Italy. And that’s a true fact. Spaghetti can be cooked in endless way from Bologonese to Spaghetti with Meatballs or just simple Spaghetti with tomato sauce. Or throw in some juicy prawns, for the ultimate Garlic prawns and spinach spaghetti. They all taste like heaven, and all are so popular, even picky little ones would gladly dig in every single time. If kids like them, they really must be good. My little monkeys are a huge fan or spaghetti, cooked in any way. Whenever in doubt, l cook her some good old pasta, and job done. Now, l’m not claiming that this pasta carbonara is the very authentic recipe. There are so many variations, every cook with his own way of cooking. I don’t think it really matters much, as long as it’s delicious and everybody loves it. And this surely is tasty. Give it a go, you’ll love it. This sauce must be the easiest to make, you need no cream, no nastiness. Just eggs, parmesan and a bit of the residual water from the pasta. Yep, that pasta we like to drain without thinking twice about it. In fact, it’s that very water that helps any sauce stick to the pasta, because of the starch released during cooking. You only need about a ladleful, no need for more. Don’t worry about the eggs being raw, the heat from the hot pasta will cook them well enough to be amazingly delicious. 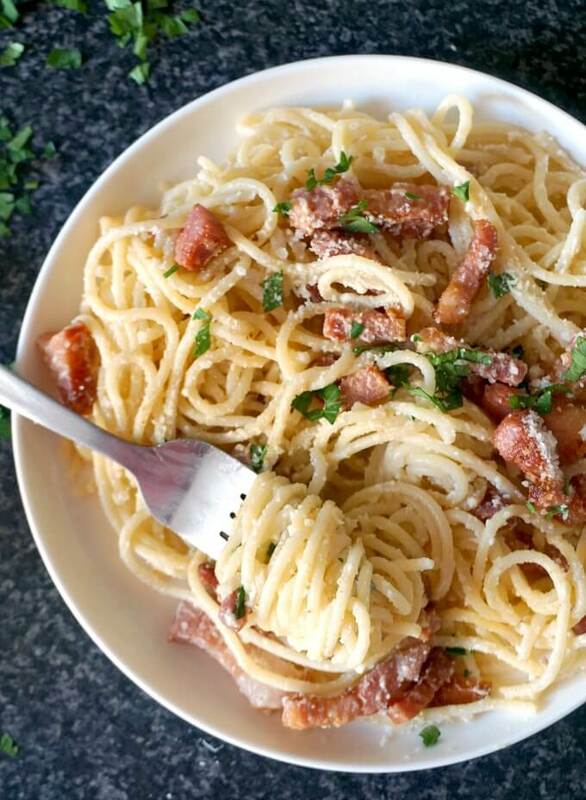 How do you make a simple carbonara with bacon lardons? Cook the pasta according to the packet instructions, reserve a ladleful of the water the pasta was cooked in, then drain the rest. Note! Never rinse the cooked pasta! This does not apply to this special recipe only, but any pasta recipe you make. The starch on the pasta helps the sauce (any sauce) stick to it. So, once the pasta is cooked, add the beaten egg mixed with parmesan, the residual water (you might not need all of it, just add enough to make a sticky sauce) with more parmesan and bacon, plus fresh parsley, and there you have, a dish to lick your fingers clean. Who said you can’t be a master chef too? 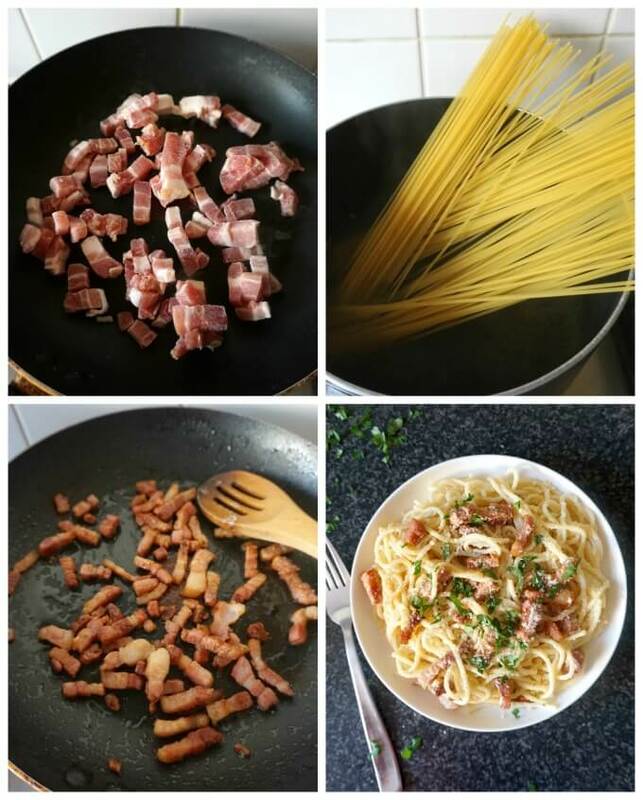 If you’ve tried my BACON CARBONARA RECIPE or any other recipe on the blog then don’t forget to rate the recipe and let me know how you got on in the comments below, I love hearing from you! You can also FOLLOW ME on FACEBOOK, and PINTEREST to see more delicious food and what I’m getting up to. 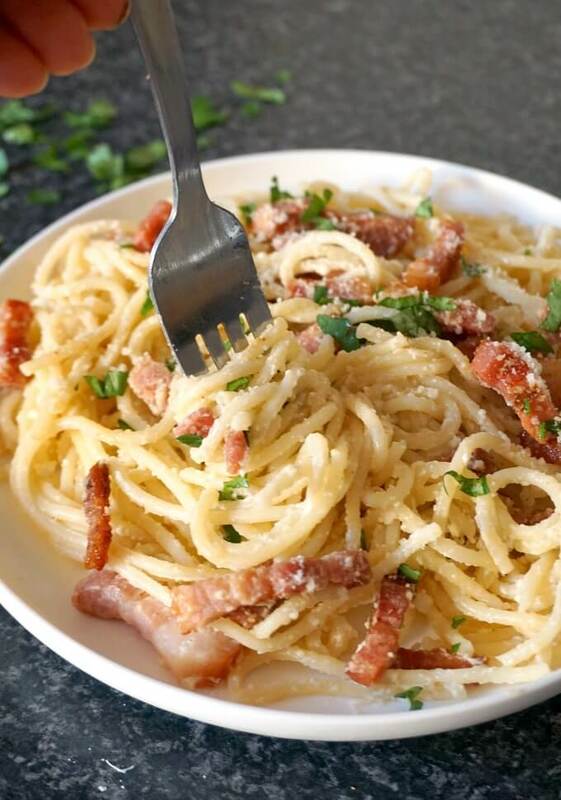 Easy Creamy Bacon Carbonara Pasta Recipe, Italy's finest spaghtti dish. Ready in under 20 minutes, this dish makes dinner a real treat. Bring a pan of water to the boil, add salt, then in go the spaghetti. Cook according to the packet instructions. Meantime, heat up a frying pan and add the bacon lardons. 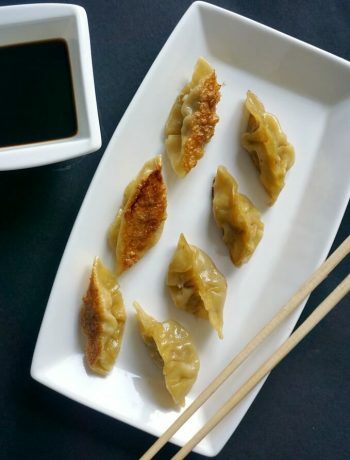 Cook until crispy. 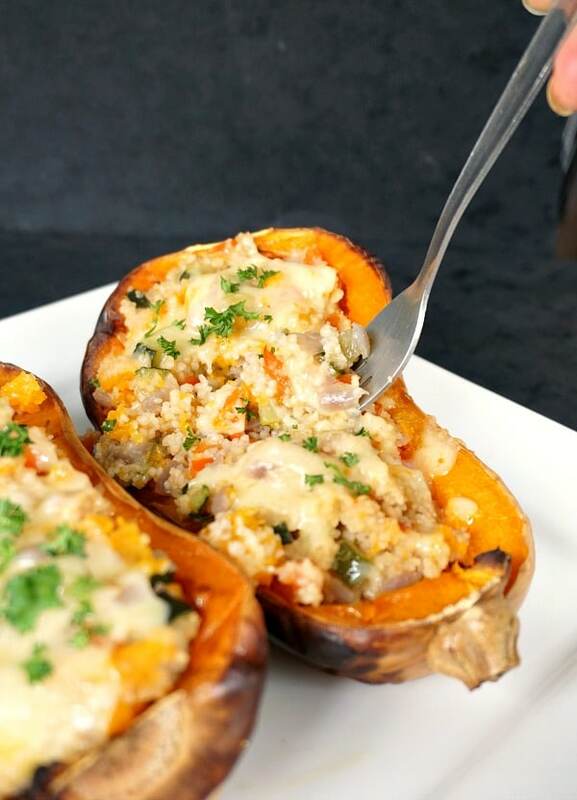 Mix in the garlic powder and set aside. In a bowl, beat the egg, then add half of the parmesan and mix well. When the spaghetti are cooked, reserve a ladleful of the water, and drain the rest. Add the cooked bacon and egg mixture and mix very well. Add enough of the cooking water to get a sauce that sticks to the spaghetti. Chop some fresh parsley and top the spaghetti. Sprinkle some more parmesan and black pepper to taste. Carbonara will never go out of style. This looks amazingly delicious. I am glad to see you at this week’s Fiesta Friday party. I hope you are having fun! Happy FF!